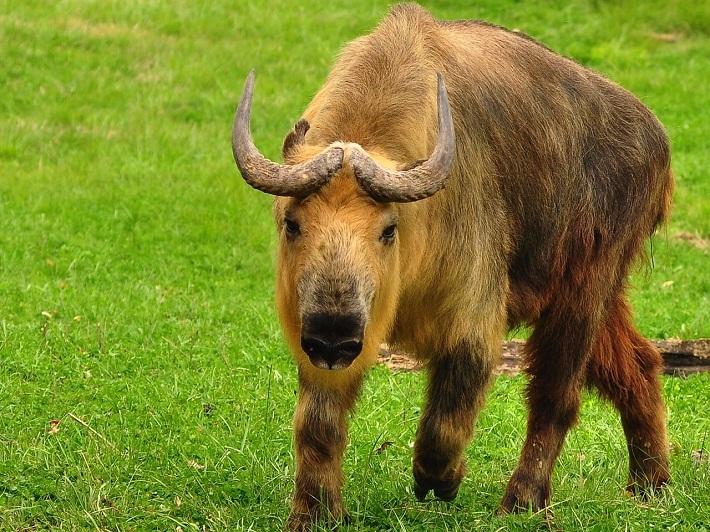 Takin (Pronunciation: Tockin’) are ungulates found in the Eastern Himalayas. 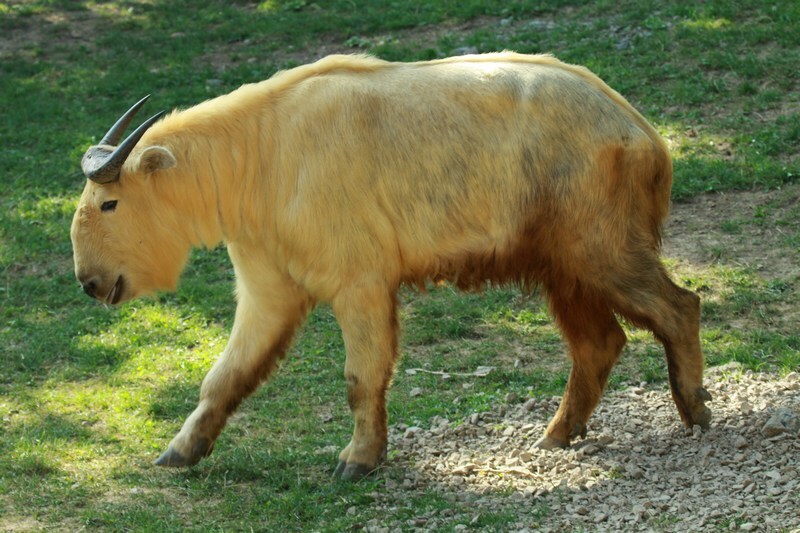 Classified as goat-antelopes, they are divided into four subspecies based on their coat color. 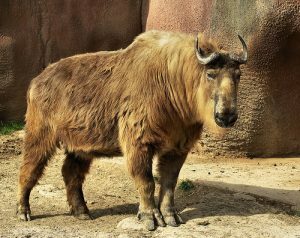 A thick, secondary pelage is grown by takins during the severely cold winters which they shed before the ensuing summer. 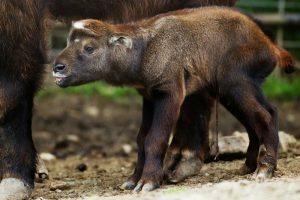 Split hooves make moving around in their habitat easier. Skin secretes a bitter, oily substance which protects them from rain and fog. Takins live in groups of around 20, especially during winter. During summer they gather in groups consisting of up to 300 individuals to browse vegetation. Older individuals mostly spend their time alone, congregating only during the mating season. Rather slow moving, they spend most of the day in dense vegetation, coming out only to feed. 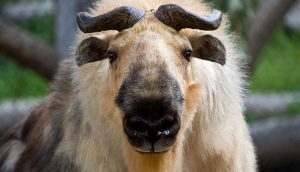 Takins migrate to lower elevations during winter from higher altitudes where they spend summer. Males often engage in horn-fights to assert dominance. Urine scents are used to gauge each others’ status and pedigree. Males spray their chest, forelegs, and face with their urine while females urinate on their tails. 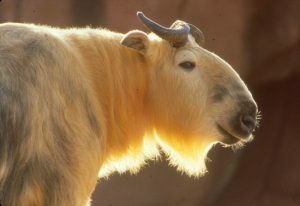 Takins observe their mating season in July and August. After a gestation period of around 7-8 months, a single baby is born with a weight of around 15 lbs. The calves start following their mothers within 3 days of birth. Within a month or two of their birth, they start to follow their mother. They eventually reach sexual maturity when they are 2½ years old. Much the giant pandas, the Chinese consider takins as national treasures. 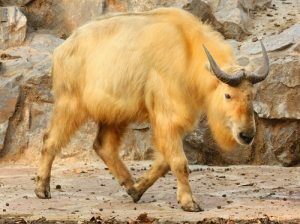 They are Bhutan’s national animal. One of the greatest threats to the takin population is humans, who hunt them regularly for meat and fur. Published on February 9th 2017 by Sudipto Chakrabarti under Coniferous Forest Animals.